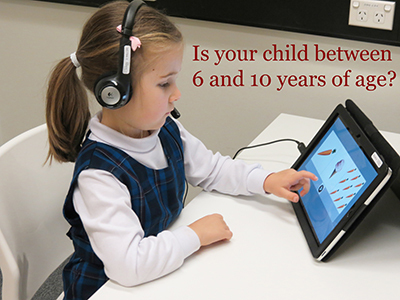 Typically developed children aged between 6-10 years of age are invited to participate in an Italian second language learning research program at The MARCS Institute, Western Sydney University. The six, 40-minute Italian language learning sessions are designed for Australian-English speaking children with no prior second language experience. Your child's language abilities will be evaluated before and after their exposure to Italian. These sessions can be held at your child's school, home or at a Western Sydney University campus. Touch-screen computers will be used, your child will learn Italian by playing language-learning games. Participating in these sessions will be an enjoyable experience for your child while they learn a fantastic new language and earn rewards along the away. Please see the table below for gender and age ranges required for the sessions.